Big Data has grown in IoT, Data Lakes, Advanced analytics, Machine Learning, and real-time analytics use cases. It has pulled in various master, operational and historical data from the enterprise, enabling Big Data to widen the insights it provides in complementing existing operational and business intelligence systems, also supplementing or offloading those systems on a lower TCO scale-out Big Data architecture. This has led to the need for a richer and wider set of application workloads to be supported on Big Data platforms, ranging from stream ingest and processing, to transactional and operational, to ELT, to Business Intelligence, to advanced analytics. This also entails integrating the varied data models in the Big Data world, of search, graph databases, document processing, etc. A mature solution exists, with decades of investment and many patents to its name, open sourced as Apache Trafodion, and commercialized as EsgynDB, that has been addressing many of these wide HOAP application needs of customers across the world. It has been deployed by customers in the Cloud, as well as in multi-tenant deployments on premise. Esgyn is introducing EsgynDB Strato, which facilitates self-service deployments of “IoT” applications, “Run your business” operational applications, “Optimize your business” Data Lakes, BI, and analytics applications. It will also offer a full white glove concierge Managed Service, for customers to just focus on their cloud or on-prem applications, and let Esgyn take care of the database, from design, to creation, to management, to monitoring, to tuning, enabling customers to get to production value faster and be more successful. Customers can choose what services they want managed. 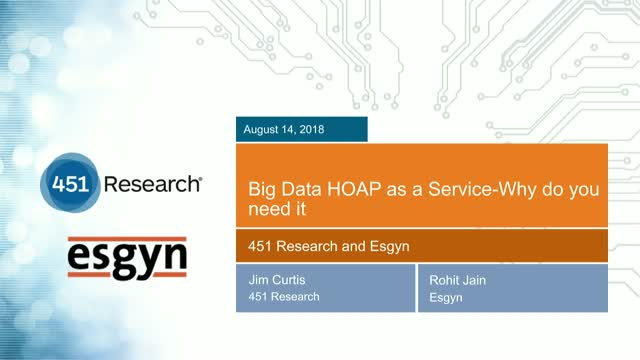 In this Webinar, we will introduce you to EsgynDB Strato, to help you appreciate what differentiates it from the rest of the Big Data solutions, as the single solution for all your Cloud based HOAP needs.